The second post season GP3 Series™ test kicked off today in Valencia, and once again there were a lot of fresh faces in the paddock. 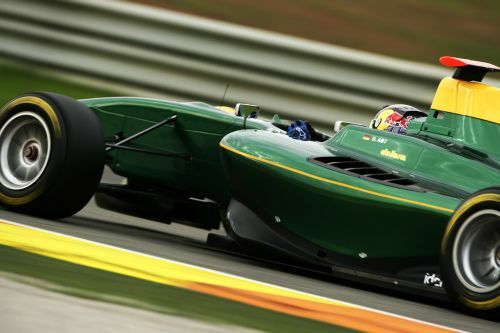 The new batch of drivers hoping to impress teams and grab a coveted 2012 race seat included Japanese F3 champion Yuhi Sekiguchi and Formula Arbath vice-champion Patric Niederhauser. And along with the newcomers some more familiar names returned to the GP3 field including American Conor Daly at Carlin. Overnight rain meant the teams had to contend with cold and damp conditions in Valencia this morning. Once the session was underway the young drivers hit the track on wet weather Pirelli P Zero tyres to complete installation laps and get to grips with the tricky conditions. Maxim Zimin was first to top the time sheets for MW Arden during a stop/start first half of the session due to a number of red flags. As the drivers got to grips with their new machines and the times started to drop it was Lotus ART’s rookie Daniel Abt who was the first driver to break the 1:40 barrier. Patric Niederhauser, Will Stevens, Robert Visoiu, Tom Blomqvist and Will Buller also took their turns at the top of the time sheet until GP3 regular Matias Laine moved ahead – the Marussia Manor Racing driver was one of the first to switch to slick tyres. As the session drew to a close sophomore drivers Marlon Stockinger and Daly swapped fastest times, but in the end it was rookie Abt who took the honors. Niederhauser grabbed P2 ahead of Victor Guerin, Daly, Laine and Stockinger. By the start of the afternoon conditions were much improved and it was Laine who set the pace for the majority of the session. The young Finn went quickest early on, before being briefly knocked off the top spot by rookies Abt and Blomqvist. By midway through the session Laine was firmly back in control and his time went unbeaten until Abt moved back into P1 with just twenty minutes remaining on the clock. With the rest of the field unable to match his pace, the German held onto the spot for the remainder of the session ahead of Michael Heche for Jenzer Motorsport, Laine, Tio Ellinas, Will Stevens, Tamas Pal Kiss, Yuhi Sekiguchi, Niederhauser, Blomqvist and Daly rounding out the top ten. Testing will resume tomorrow at 09:00 am local time.